The Lot Valley: Everything you ever wanted to know! Home > Blog > The Lot Valley: Everything you ever wanted to know! 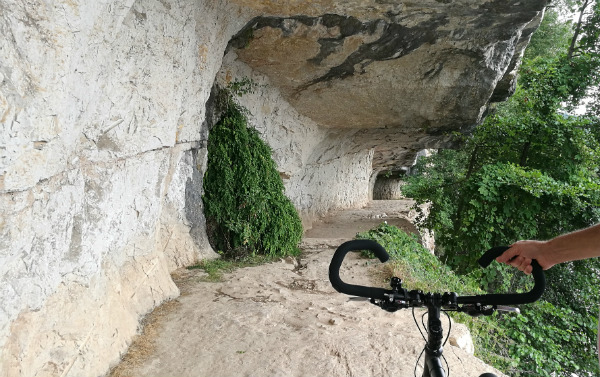 Unlike many of France’s waterways, the Lot Valley is unusually tourist-free, so it makes for a relaxing destination in a motorhome or campervan. The river is only navigable in short sections, so the mass invasion of hire boats that has taken over other waterways, such as the famous Canal du Midi, just isn’t apparent here. This makes it a very peaceful and authentic part of France to explore, and the river views are generally uncluttered by huge clusters of fibreglass boats! 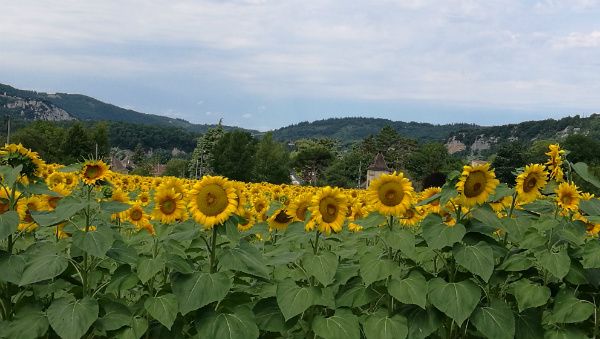 We started our Lot Valley adventure at Castelmoron-sur-Lot and finished it at Tour-de-Faure. We followed the river, stopping for a night or two in – and sometimes in-between – each new village, town or city we came to. There’s a huge amount to see here and we thoroughly enjoyed the tourist hotspots along the route, but for us the highlights of our trip were the peaceful cycle routes, swimming in the beautiful, clean river, visiting the open air markets and people watching in the village bars under the evening sunshine. Self-catering is an effortless joy here. 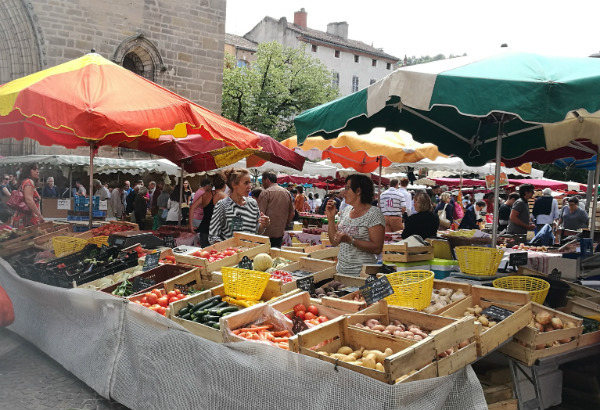 In addition to the many local, pre-prepared dishes sold in traiteurs (delicatessens) and at the markets, the climate generates wonderful produce too, so rustling up a quick supper is dead easy. The sort of meals we enjoyed most were perfectly ripe and flavoursome tomatoes with fresh basil, olive oil and delicious French bread to mop up the juices; then trout, fresh from the river, cooked on the barbecue and a homemade plum tart from the village patisserie. Just a little further south of where we toured is the town of Agen (home to probably the most famous prunes in the world). The whole area is covered in plum trees with many opportunities to taste both prunes, plums and every kind of liqueur or preserve you make from them. 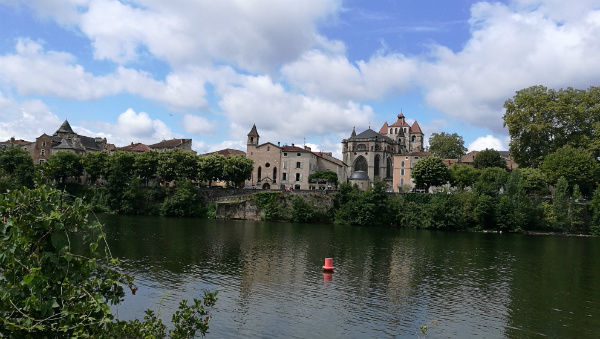 The wines around Cahors are good too, and whilst the area is known for its inexpensive reds, many winemakers also produce great value whites and rosés, so you are bound to fine wines that suit you. Eating out is inexpensive and varied so if slicing a tomato and grilling trout is too much effort, you can enjoy dining out without breaking the bank (see below for the restaurants we enjoyed). Bistro de Lisa, in the town of Cahors: Don’t expect to linger at your table after your meal, there will probably be a queue of people waiting for it! However, the food was good basic fare, house wine was excellent and service was fast (rare in France!). 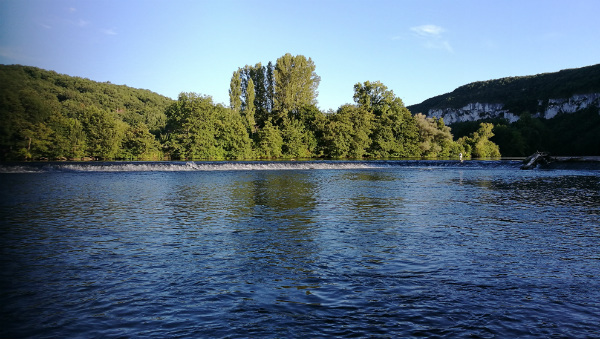 There is an “aire de service” in Cahors right by the river, a campsite about 5 minutes from the town, plus lots of spots down by the river where you can park without being moved on. La Truite Dorée in the village of Vers: By far the best meal we had during this trip. Lovely setting, great service and sublime food. Prices here are not quite at everyday dining level, but for a special occasion it is very reasonable and truly perfect on all fronts. 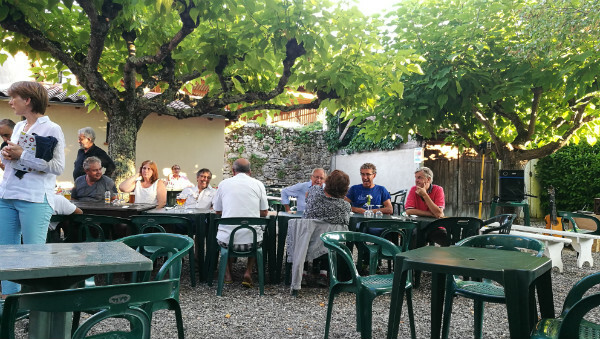 The restaurant is in the village of Vers where there is both a campsite and an “aire de service” so it is easy to park your campervan for the night. La Cantine, Villenueve-sur-Lot: Not the best decor but run by a caring couple who make you feel very welcome and the chef prioritises local produce to make tasty dishes. An agreeable experience and very good value. There is a campsite just across the river from the town. Cahors: A wonderful medieval city with interesting historic buildings everywhere, cobbled streets, ancient bridges and river views. The market was particularly good and sells everything from fresh fruit & veg to some really quite decent clothes and souvenirs. The tourist office in the city centre is really good, so head there at the start of your visit to learn about everything local from wine tasting opportunities to city walks. 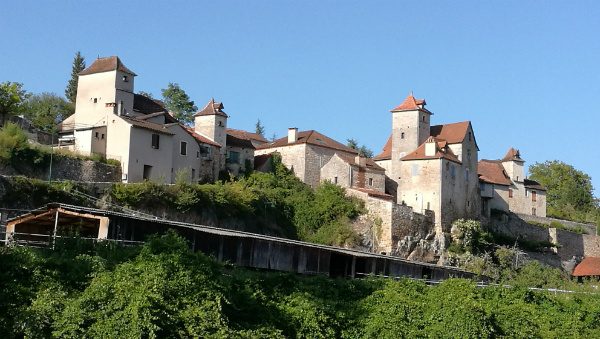 St Cirq Lapopie: A beautiful medieval, hillside village that is home to many craftspeople, from potters to wood turners, all of whom have little shops. Great views of the Lot Valley from the top of the village and many cafe and restaurant stops for refreshments. 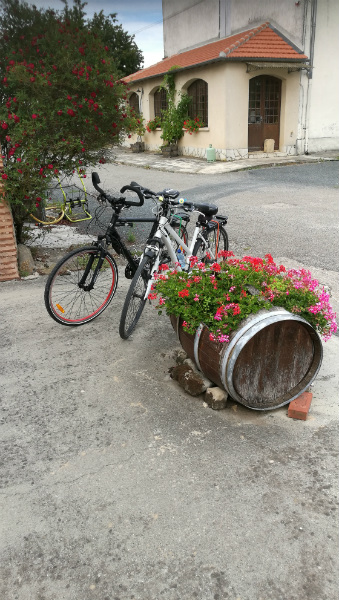 We had a fantastic time cycling along the river and exploring the many pretty villages, buying local delights in the produce markets, people watching in the busy towns, wine tasting, swimming in the river and enjoying peaceful river views wherever we parked. To see more of my photos of the Lot Valley markets, take a look at my blog from a couple of weeks ago. ← Can we bring our pets with us on a campervan trip?